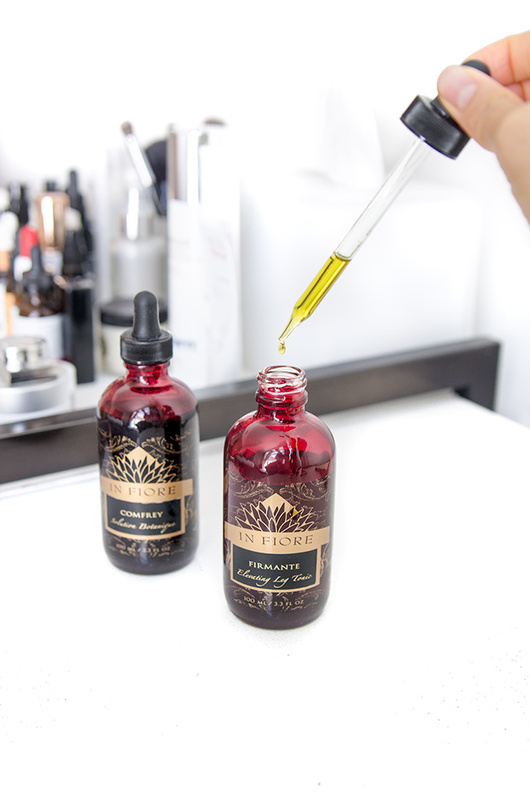 These next two products that I’ve been testing from the intoxicating green brand In Fiore really straddle the line between cosmetic and medicinal – leaning more towards the latter in my opinion. Their potent actives improve the look of skin, but have the power, as I explain from my experiences, to reduce inflammation, minimize the appearance of varicose veins and cellulite by improving circulation and reducing swelling in the legs, and soothing itchy skin. Read on for my full review of the In Fiore Firmante Leg Tonic and the Comfrey Solution Botaniqué, and then head over to my Instagram page to enter to win both! Review: This oil works wonders to soothe dry, itchy or irritated skin. When I started using it, I was taken aback by how quickly it soothed inflamed areas, but I guess it shouldn’t come as a surprise since the essential oils in the Comfrey Solution Botaniqué have been used for centuries as medicinal plants. The main active ingredient, Comfrey essential oil for example, was reported in the Wiley Blackwell Journal in 2012 to stimulate tissue regeneration, reduce inflammation and have analgesic (pain relief) effects. The blend of anti-inflammatory (nettle and frankincense), antiseptic (helichrysum), antimicrobial (rosemary), antioxidant rich (avocado and jojoba oil) and cellular regenerative actives and essential oils can combat swelling, itchiness and redness. And have helped with the currently very itchy, red inflamed bumps on my skin right now. This oil has helped to soothe my skin: reduced the itchy welts, minimized the redness and helped with itchiness. I feel like this would be really good for people who have eczema, dealing with sun burns or chapped, dry skin. And we need to discuss the texture and scent of this product for a moment!? The experience of In Fiore products is unparalleled. You’re truly getting a luxury viscersal experience, which explains why Steven Tyler the lead singer of Aerosmith, Liv Tyler and Kate Hudson are devotees of this brand. Finally, I just want to say that this product is very expensive, but I see it more as a spot treatment than an all over body oil. And you only really need a few drops to adequately soothe specific areas of the body. Scent: Strong woodsy, refreshing herbal scent from the rosemary and nettle with a hint of citrus from the bitter orange and light floral notes from the lavender. Very complex as most of their product scents are, and very luxurious. This is a product to indulge in after a long bath, a glass of wine and a good book. Review: The Firmante is a lightweight, fast absorbing oil that uses potent anti-inflammatory and antiseptic essential oils (i.e. dandelion, cypress, rosemary), and soothing hydrating actives (calendula, avocado and jojoba) to tighten, tone and improve the look of skin. But the real star here is it’s use of horse chestnut seed extract to stimulate lymphatic flow, decrease swelling and vein and cellulite visibility. Horse chestnut extract, one of the main actives in this leg oil, has been proven in studies to reduce swelling of the legs and encourage improved circulation as well as compression socks. And according to Dr. Weil, circulation problems in which the veins do not efficiently return blood from the legs to the heart can cause varicose veins, ankle swelling, and nighttime leg cramping. My issue with my legs is cellulite, visible vascularity, dry patches, rough patches…need I go on? I received a sample of this leg tonic months ago and quickly became obsessed with it. 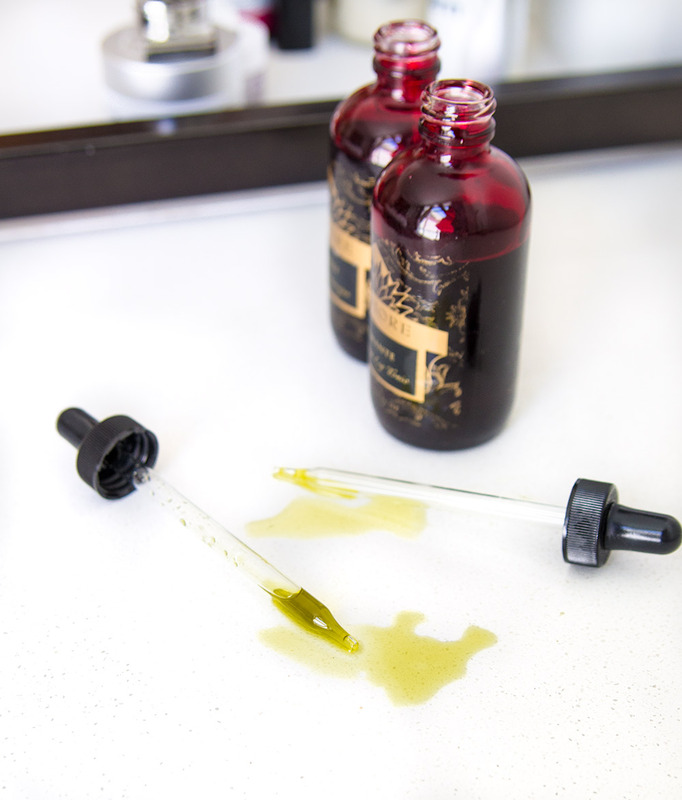 The oil sinks right in leaving a satin finish like a dry oil; the scent is woodsy, heady, and intoxicating (like all of In Fiore’s products); but it’s the glow, even texture and improved skin tone I can’t get enough of. I also noticed that the uneven red blotchiness on my legs (due to constricted capillaries from sun damage over the years) has improved. My skin looks very clear and vibrant. I can’t tell if it’s improved my cellulite quite yet, but the vascularity has definitely improved! But it should for this price… basically I’m applying the same high quality ingredients I apply to my face but on my legs. How to use: I like to use one pipette for each leg using sweeping motions upwards towards my heart as I apply the oil. (You’ll notice a slight tingly sensation #love). This oil does go fast. I’m already a fourth way through the bottle and trying to savor every last drop. Eeek! Scent: Strong herbal scent from the spruce leaf, cypress and rosemary extract with a hint of citrus. Very complex, yet refreshing! Can Cryotherapy Improve The Look & Health Of Your Skin?